Fred R. Burley, the founder of Berlei Limited believed that preference for Australian made goods was a vital thing in the national life of Australians. In 1923, with the support of famous brands including Berger, Tooheys and Uncle Toby's, he founded the Australian Made Preference League, and was also its first president. In 1925, Mr William Bagnall became the league's Managing Director, and it was he who organised the Great White Train campaign for advertising in Australia. In March 1926, Wagga welcomed the visiting train as "a practical step towards building up secondary industries, and so providing an industrial population and a market within our own boundaries for our primary products" [DA, 25 March 1926]. Numerous local businesses supported the visit - including P.A.C Haberecht & Co. (Melodee Music Parlours, Wagga), W.H. Sherwood (Tent and Tarpaulin Maker), David Copland & Co., Kelly & Cunningham Drapers, Minty's Motor Garage, T.J. Sheekey & Co. Cordials, The Murrumbidgee Milling Co., Wagga Rubber Works, Hardy's Limited, John Gelme Limited (Coachbuilders), Nesbitt's Furniture Warehouse, Hunter Bros., and furniture store Maples. 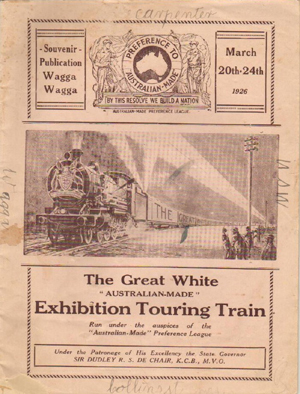 The Great White Train stayed in Wagga for four days: Saturday 20 March - Wednesday 24 March 1926. The two souvenir publications held in the Museum's collection - the commemorative edition of The Daily Advertiser newspaper, and the official programme - serve as tangible relics from a brief but interesting period in Wagga's history, which would have largely passed from living memory today. "This will mean providing employment for the boys and girls, making it unnecessary for them to leave their home-towns when they need employment. A sucessful factory will moreover, mean a good buyer for the primary producers of the district. It will, finally, mean better and brisker trade for the local shopkeepers."